With it’s super functional dribble curve, snake like looks and Malik quality, the Limited Edition Malik Cobra hockey stick could just be one of the most awesome Malik hockey sticks I’ve had the pleasure to review. Across the pitch on an away day I noticed an unsuspecting, though proud Malik Cobra owner warming up in the rain. I had read about this limited addition when researching other Malik hockey sticks and couldn’t believe I had found one. My first thought was “I have to review you!”. Ken owned the stick and was very excited that I picked up on his Malik Cobra stick, just to reiterate, I picked up on this stick from 60 yards away, the amazing green of the shaft in contrast to the ultra white handle stands out, it stands out a lot! I asked Ken some questions first. He had had the stick for 4 months and it had spend 2 months in his wardrobe because of the summer break. It might explain why it still looked so bright. He described the Malik Cobra as a dribblers dream, having moved from a lower bow TK hockey stick before which Ken had found uncomfortable to dribble with he was delighted to have the higher shaft bow position. For those who aren’t aware (possibly the reason you are reading this review) the Cobra limited edition includes the Malik dribble curve shaft. This shaft is one of my favorites being a very curved 24mm and slightly higher in the shaft than most other brands low bows at 280mm up from the ground and lower than many normal mid shaft bows which are generally up at 300mm. This 20/30cm difference in position does have a fantastic impact on ball control in my opinion. And to the contrary the Malik Cobra doesn’t loose all the benefit in pushing power you expect from the lower bow shafts. Not exactly a flickers dream but as Ken said, the Malik Cobra Limited edition is for the ball carriers not the ball flickers. So when Ken stopped talking about how great the stick was, he kindly allowed me to have a play with it. As well as the dribble, which I have been lucky enough to play with on other Malik sticks, the thing I noticed about the Cobra limited edition was the feel I got receiving the ball. The impact of the ball on the stick was certainly lighter than I have experienced from other hockey sticks and it was the major thing I noted from about the Malik Cobra. Having handed Ken a Gryphon Taboo Striker while I tried the Malik Cobra the most noticeable difference was the power this stick lacked when hitting passes. Combining the light feel when receiving the ball with this light feeling when hitting it. Be under no illusion, if you are looking for a stick that will allow you to hit the ball harder, unfortunately this isn’t the stick for you. Based on the above I wasn’t surprised when I re-read online articles and found that the Malik Cobra has 45% Carbon, 50% fibreglass and 5% aramid material composition. Do not get me wrong, the Malik Cobra hits the ball, it is also fantastic at push passing, the curve and the bow position makes it great at creating a slingshot effect on the ball. I would just say if smashing the casing off of the ball is what you are looking for, this might not be for you. In contrast you can glide around the pitch with the ball nicely under control because it really is great to dribble with. Over and above anything else in my review though, the looks of the Malik Cobra Limited Edition are amazing. I really can’t get the vibrancy of the green out of my mind. It’s not all looks though, that would be a silly way to leave this review of the Malik Cobra which is, actually, a fantastic hockey stick not least for it’s gorgeous looks, AMAZING dribble curve shaft and all the other quality that Malik bring to every stick they make. Probably it should be price just south of £100 GBP but there is justification for paying a little more for something of beauty. 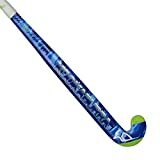 If you are wanting a Malik Dribble Curve stick (you know who you are, you have had one before) and want to be noticed in the rain 60 yards away, I hope you can see from this review that the Malik Cobra Limited Edition is your hockey stick. UPDATE Sept 2015 – Publishing this review I can’t see much stock on this Cobra from Malik. Buy under £100 – I have seen this online at less than £100 in the UK, see if you can get it for that!